Image Size: 16.5 X 13.5 in. As part of a promotional stunt for the film Slave Boy, Fred wins movie star Stony Curtis as a slave for a day in this classic Flintstones episode from October, 1965. Tony Curtis was among the series’ most popular guest-voices, including Ann-Margret, Harvey Korman and the cast of “Bewitched”. 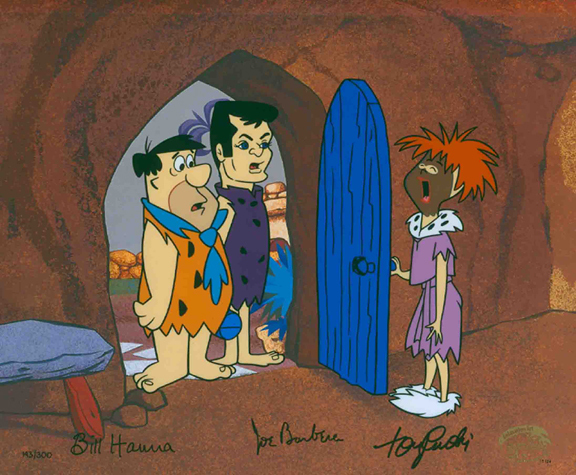 The Return of Stony Curtis from Hanna-Barbera animation Art highlights Stony’s famous first encounter with the fuzzy-slippered housewife Wilma.